Those who have been following my blog for a while will know that my family never gets tired of pancakes. I usually make pancakes on Saturday morning for PJ and cartoon time with my boys. This week I had some fresh peaches in the fridge that needed to be eaten up and I remembered playing with a banana/pineapple topping a few years back that I thought would go well with the peaches. It did and it's super-easy! Melt the margarine in a saucepan over low-medium heat. Add the brown sugar and peaches and mix well. Cover to let everything simmer together while your pancakes are cooking. I love that you have a 'tradition' on Saturday mornings....this is similar to what my siblings do with their family. We three, in my little family, all have different tastes so our breakfast is quite a 'mix'. 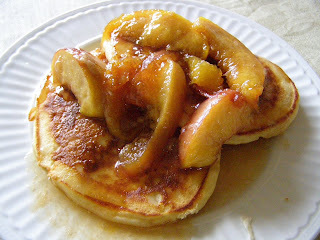 However, pancakes are so homey and good...yum...and what a great addition...peach topping. Must give that a try. Pancakes are a favorite around here, too...as are peaches, so I should definitely try this! They look yummy. This looks SO SO good. I'd love to have a plate of these for dinner tonight! I love fresh peaches and their smell. But Mr. H won't let me bake or cook them, so i stick with the frozen variety for that. You have a lucky family! You're really pulling out the quick, easy, and tasty recipes! I love it! Thanks for sharing! Lover of books and good food! Family friendly. WW Canada member. The Best Mac & Cheese I've Ever Had!